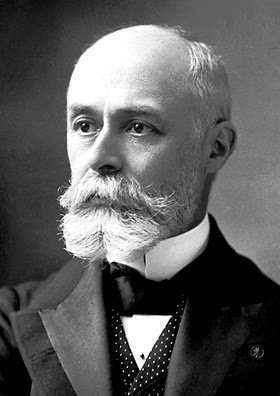 Biography of Antoine Henri Becquerel (15 Dec.1852 – 25 Aug.1908) - Robolab Technologies Pvt. Ltd.
Antoine Henri Becquerel was born in one of the world’s most beautiful city, Paris, On December 15, 1852. His father, Alexandre Edmond Becquerel (1820-91), his grandfather, Antoine Cesar Becquerel (1788-1878) and his son Jean Becquerel (1878-1953) too, were all scientists. Thus, Henri was born in a well-educated and cultured family of scientists. After his early schooling at the Lycee Louis-Le-Grand, Henri received his formal scientific education at the Ecole Polytechnique (1872-74) and had engineering training at the Ecole des Ponts et Chaussees (Bridges and Highways School 1874-77). In addition to his teaching and research posts, Becquerel worked as an engineer in the Department of Bridges and Highways for many years, being appointed chief engineer in 1894. He took up his first academic position in 1876 as assistant teacher at the Ecole Polytechnique, where in 1895 he succeeded to the chair of physics. Concurrently, he was assistant naturalist to his father at the museum, where he also assumed the physics professorship upon his father’s death. Becquerel studied the effects of radioactivity and radioactive decay. In this study he found that when ultraviolet light fall on the material, it tries to absorb the radiation energy. Due to this, electromagnetic radiations are emitted. The material radiates if it is in an excited state with the help of electromagnetic radiations of if it is made up of highly charged and energized particles. Till the energy to radiate is present in an object, the event or phenomenon is visible. This is known as phosphorescence. When the object stops radiating light it gets into a state called radioactive delay when there is no radiation visible. Becquerel then concerned himself with infrared radiation, examining, among other things, the spectra of different phosphorescent crystals under infrared stimulation. He extended the work of his father by studying the relation between absorption of light and phosphorescence in some uranium compounds. In 1891, his father Alexandre died and in his place Henri Becquerel was appointed. He extended the research in the field. He used the sun as the sole energy source. He never had any sophisticated or costly instruments for his research. Some salt crystals of uranium, or a some photographic plates and the never ending source of light – the sun was all he had. Becquerel would store photographic plates from light in his drawer wrapped in a thick black paper. One day, when it was unusually cloudy with no sight of the sun, he wrapped a small specimen of the element in the black paper around the photographic plate which was unexposed, and left for home. Next day he returned to check the plates. Becquerel wondered whether some unknown rays like X-rays discovered by Roentgen earlier, had left behind their traces on the photographic plates. He studied the plates and after developing then found the traces. He came to a conclusion that uranium and potassium sulphate have some kind of radioactive substance that leave behind traces on a photographic plate. Becquerel rechecked his experimental results and finally arrived at the conclusion that uranium salts constantly radiate some rays which effect photographic plates. This was indeed a new and wonderful discovery. Exactly after one year after the discovery of the famous X-rays, Becquerel announced this discovery. Becquerel’s co-researchers termed them as Becquerel rays. In 1898, Madam Curie renamed these radiations as radioactive rays and the corresponding activity as radioactivity. Radioactive rays consist of (positively charged) Alpha particles, (negatively) beta particles and uncharged gamma rays. Other scientists were drawn to studies of radiation phenomenon due to Becquerel’s researches. His contemporaries Pierre and Marrie Curie achieved remarkable success in the field. They discovered new radioactive elements thorium, polonium and radium, which was several times more radioactive than uranium. In 1903, Henri Becquerel shared the Nobel Prize for Physics with Pierre and Marie Curie. The last decade of the nineteenth century saw many important discoveries. Further research was carried out after the discovery of Becquerel rays. In 1897, Sir Joseph John Thomson analysed the radioactive rays and discovered negatively charged beta particles. Thereafter, Ernest Rutherford and other scientists studied alpha particles and proved that they are positively charged. Paul Villard discovered gamma rays which are electromagnetic radiations of very short wavelength and have maximum penetrating power among alpha, beta and gamma rays. This great scientist died at the age of 56 on August 25, 1908, at Le Croisic, France. His discovery of radioactivity has been of vital importance and utility to us, even today. Radioactive isotopes have many applications. Geo-physicists in particular, have found multipurpose utility of it. With the help of isotopes, they can determine the age of earth, rocks, mountains and oceans. Apart from this, important and useful information about comets, moon rocks and rocks from Mars and other planets can be obtained. They can determine the precise age of the rocks. The physical Research Laboratory based at Ahmadabad, has developed the facility to determine the exact age of any sample including the age of archaeological specimen. It has been developed as a national facilitation centre. One can send any sample to this centre to know its exact age. In times of peace, such radiations are used to develop new methods for the benefit of industries, medical sciences and agriculture.